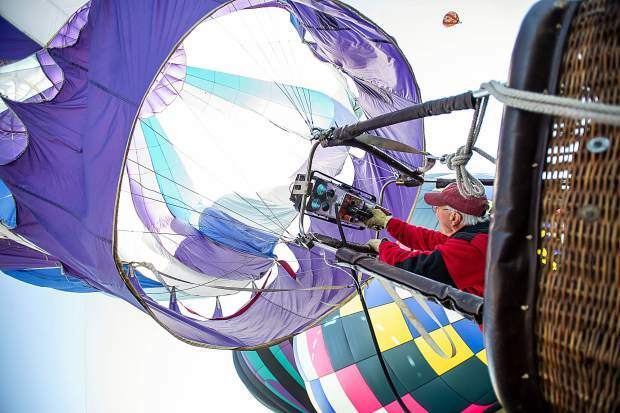 Colorado Springs Pilot Stephen Blucher deflates the envelope of his balloon "Morning Glory Too" on Friday for the 43rd annual Hot Air Balloon Festival in Snowmass. 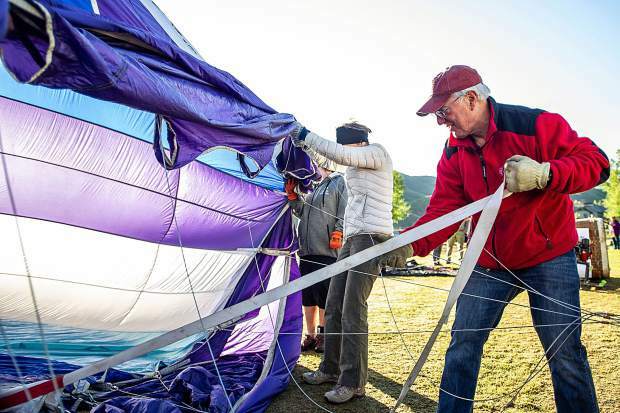 Colorado Springs Pilot Stephen Blucher inflates the envelope of his balloon "Morning Glory Too" on Friday for the 43rd annual Hot Air Balloon Festival in Snowmass. 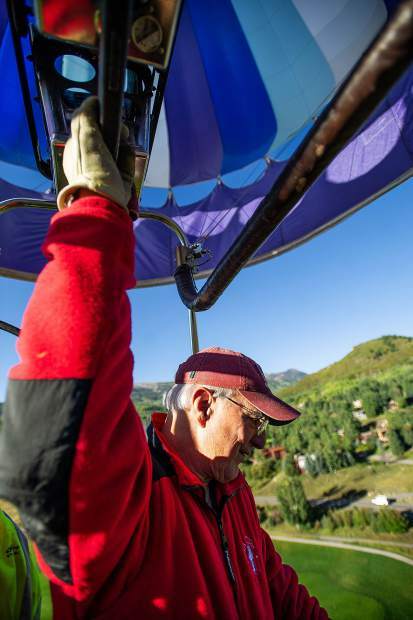 Colorado Springs Pilot Stephen Blucher peers over the edge of his balloon "Morning Glory Too" for a good landing spot on Friday for the 43rd annual Hot Air Balloon Festival in Snowmass. "Morning Glory Too" hot air balloon crew member Beverly Voelker holds a picture of one of the original hot air balloon sketches next to Colorado Springs Pilot Stephen Blucher on Friday for the 43rd annual Hot Air Balloon Festival in Snowmass. 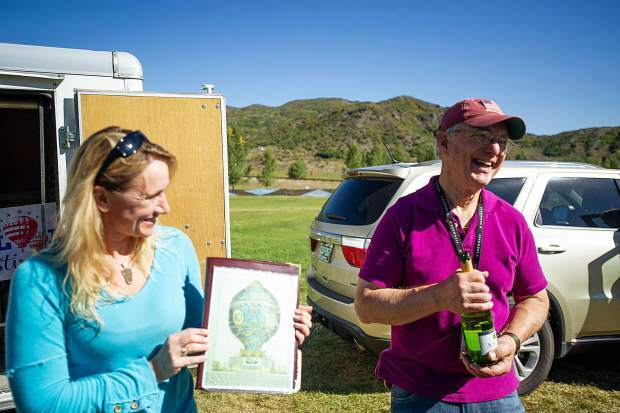 Hot air balloon volunteer Beverly Voelker holds a picture of one of the original hot air balloon sketches next to Colorado Springs Pilot Stephen Blucher on Friday for the 43rd annual Hot Air Balloon Festival in Snowmass. 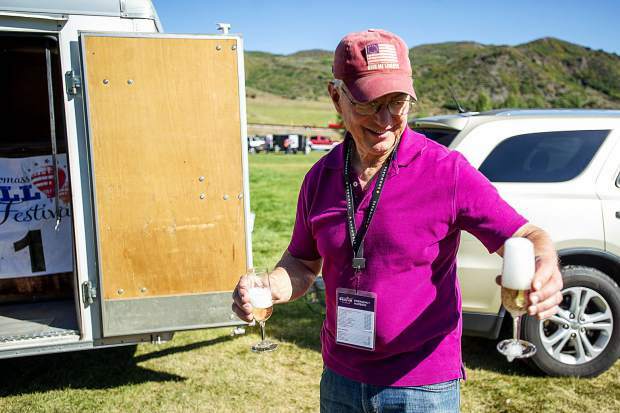 Colorado Springs Pilot Stephen Blucher holds out an overflowing glass of champagne after a successful flight on Friday for the 43rd annual Hot Air Balloon Festival in Snowmass. For more information, visit www.gosnowmass.com. 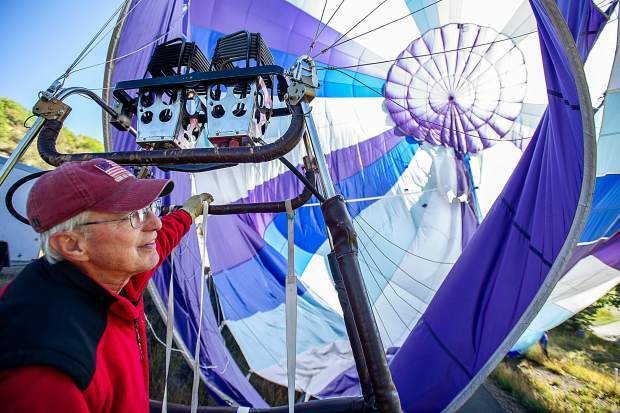 In Stephen Blucher’s near five decades of flight, the hot air balloon pilot has officiated weddings, watched proposals go awry and experienced his share of sketchier moments — striking a power cable or nearly falling out of the basket. A tribe of vivid colors will pepper Snowmass’ bright blue sky again this morning as part of the picture-perfect event. Drawing thousands of visitors to the area annually, the Snowmass balloon fest is one of the highest-altitude balloon events in the country. Blucher’s “Morning Glory Too,” painted with stripes of purple and various shades of blue, was one of 30 hot air balloons to soar over the village this weekend as part of the time-honored festival. The pilots typically travel with a crew of volunteers who are essential in helping transform a bundle of 90,000 or more cubic feet of rip-stop nylon and a wicker basket into an object that’s safe to fly. Altogether, Morning Glory Too weighs nearly 640 pounds — 330 for the envelope (the term for the actual balloon) and 304 for the basket — and therefore requires several hands on-deck. Crews often consist of spouses, family members, friends, fellow balloon enthusiasts and locals or visitors who want in on the action. In fact, a number of crewmembers voluntarily travel with pilots across the country from one festival to the next, with no guarantee of ever stepping foot inside the basket. They simply love the camaraderie and being involved in any capacity. 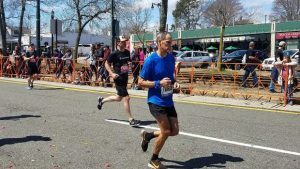 “It is a family sport,” Blucher’s wife, Jeanie, said. 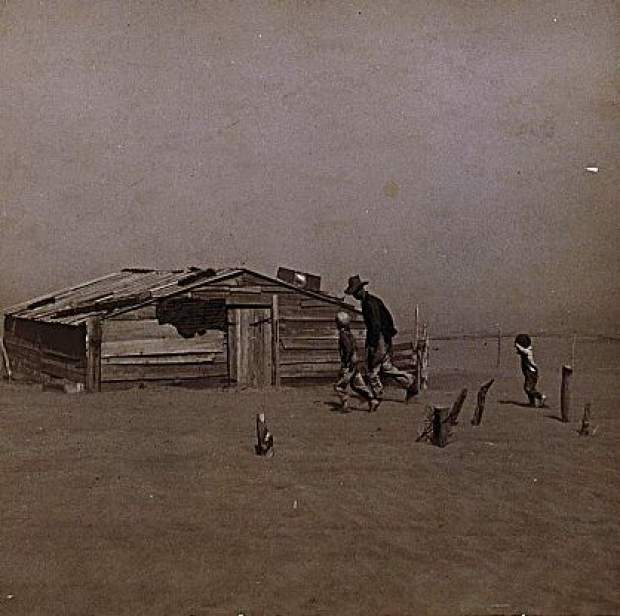 Still, now a quarter century later, “it never gets old,” Jeanie said while admiring the sky. Beverly Voelker, also of Colorado Springs, is one of those loyal volunteers. 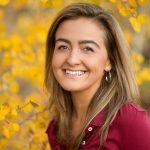 Not only has Voelker been part of the Blucher’s crew for nine years, but she’s also involved her family members — including her parents, children, nieces and nephews — all of whom have experienced a taste of flight. 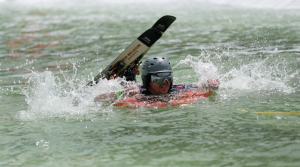 Voelker’s mother and father were at the Snowmass festival this weekend. 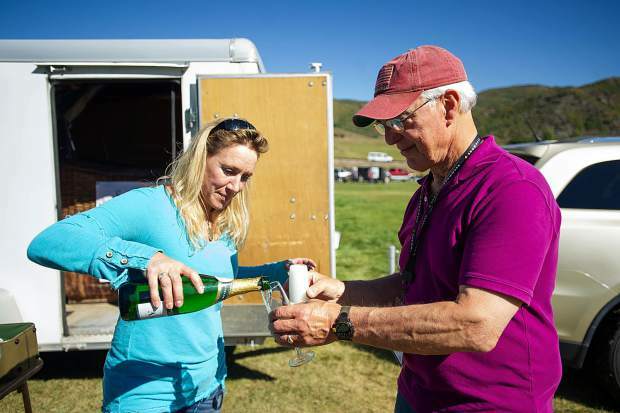 Another consistent among the ballooning community — it’s a tight-knit one, after all — is the post-flight champagne toast. 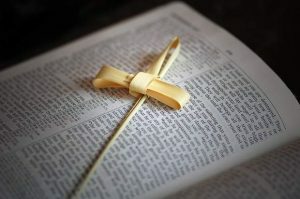 According to Blucher, this ritual dates back to the first-ever successful flight in the late 1700s. Throughout his 48-year tenure piloting private, commercial and festival gigs, Blucher estimated he has been airborne about 2,500 times. What’s interesting about leading commercial flights, he said, is “having no idea” who will board the balloon. While Blucher’s favorite part about flying is the sense of freedom, for Voelker, it’s the lack of control.